At the inception of this writing, it’s 7pm here on the east coast, 12 hours before the Vernal Equinox―or, zero degrees Aries, the start of Spring. Wanting to get a newsletter out as quickly as possible, I’ve decided to do it in true Aries style: rushed, bold, instinctive, raw and uncensored. Just do it, as the Nike ad line says. And given the time of year, what better topic to write about than Aries-Mars itself? A good place to start is with an explanation of what I mean by Aries-Mars. As with any astrological archetype, it includes sign, planet, house and aspect. All of them are comprised of angles, the exception being “planet” whose movements create angles. In astrology, all meaning is an angle (phase) of a planetary cycle. The angle that defines sign, house, and aspect for Aries-Mars is 0°. The vernal equinox on March 20th constitutes 0° Aries and occurs precisely where the earth’s equator intersects the plane of the Sun’s equator (ecliptic). In effect, it’s an Earth-Sun conjunction that marks the beginning of the zodiac. The phenomena of births, starts, and beginnings is key to understanding Aries. If we consider the zodiac as symbolizing the cycle of nature as revealed in the four seasons, each of which has three phases―cardinal, fixed, and mutable―then a natural starting point would be the new cycle of life that commences each spring. The image of sprouts pushing up through the earth seeking sunlight is a perfect rendition of Aries. Life seizes the initiative, conquers new ground, pursues its own source. It is naturally aggressive. Analogously, the Ascendant is where the spinning earth’s horizon intersects the ecliptic at any point during the earth’s 24-hour rotation. Intersection of horizon and ecliptic signifies the 1st degree of the 1st house for that horoscope. The Ascendant sign marks the birth moment and suggests how the individual will assert herself in life; that is, the native’s natural, instinctive way of pushing up and out into the world. Likewise, when two orbiting planets align in the same zodiacal degree at the same time, we call that space/time point a conjunction, which fittingly is the start of their synodic cycle.1 A conjunction of two planets in a specific sign connotes how they will combine and assert their respective natures, and perhaps begin something together. Again, the vernal equinox, Ascendant, and conjunction all constitute the same angle of 0°. Clearly, they not only share a kinship of angle, but of meaning―starts, new beginnings, and instinctive ways of asserting. The 0° angle seems to have a kinship with Mars, whose nature is consistent with the meanings we ascribe to Aries, Ascendant, and conjunction. In ancient times, all phenomena associated with Mars were presumed to be an expression of the god itself. Mars was a universal principle in Nature. As such, the red planet is part of a larger cosmic order, no less a face of the Divine than any other planet or angle within the all-encompassing 360° cycle. When speaking of an astrological archetype, I generally link sign and ruling planet together, for they are a matched pair. Sign is the need, and planet is the action. Every planetary action can be understood in the context of the need it serves, and every sign-need can be inferred from behavior characteristic of that sign. Signs are not merely needs, but also sets of traits naturally geared toward satisfying the underlying need. When a planet is in a sign, it activates the behavioral attributes of that sign. Before examining Aries-Mars in greater depth, let me first define my terms and offer a few keywords. In observing Aries behavior, four interrelated needs can be inferred: Survival, freedom, action, and novelty. The primary need of Aries is survival, beingness, perpetuation of one’s own existence. Self-preservation is the first law of nature and the basis of all other needs. Essential to our capacity to be is the freedom to act in our own self-interest, for freedom is inextricably related to survival. If we are not free, survival is jeopardized. Synonymous with freedom are needs for autonomy and independence, threats to which are a common cause of fights and war. Joining this short list is the need for action and movement―which is perhaps the most basic property of life. You know something is alive by its capacity to move itself. Even at a cellular level, life moves. To be is to do. Finally, Aries also symbolizes a need for novelty, or adventure; the instinct to do something simply because it has never been done before. Novelty is a natural extension of life’s prime directive to perpetuate itself by finding new areas in which it can begin, survive, and flourish. As with every set of needs associated with a sign, Aries’ needs are interdependent and self-consistent. All Aries behavior can be understood in the context of these four primary drives: survival, freedom, action, and novelty. As the active agent of Aries needs, Mars actions fall into four subsets: assert, initiate, fight, and encourage. To assert includes related actions to act, declare and affirm. Again, Aries-Mars rules beginnings, which entails initiating, starting, or giving birth to new endeavors. And as the warrior archetype, Mars’ actions include the impulse to fight, compete, and battle for dominance. Our final Mars action-category, to encourage, means to excite, strengthen, or embolden someone or something. While the primary state of Mars is simply beingness, its action keyword is “I do.” Mars is action oriented. Go for it, just do it, these are key Martian sentiments. Mars quickens, emboldens, invigorates, vitalizes, and enlivens the expression of whatever planet it aspects. It encourages and galvanizes that planet into action. Planetary actions never occur in vacuum but in relation to whatever sign and house the planet occupies and toward whatever planet it aspects. If Mars is in Taurus, for example, it might assert in a slow, steady manner; act in the service of resisting change; start a new garden; and fight to retain holdings. Like a pit bull, Mars Taurus hangs tough: never say die, dig in your heals. If these actions fall in the 11th house, the person could be an environmental activist spurring a movement of like-minded others fighting for the cause of conservation. Mars in aspect to another planet will be inclined to fight for or against what that planet symbolizes, contingent upon the angle. Trines and sextiles incline Mars to assert happily in the interest of the other planet. Mars in opening trine to Jupiter, for example, might initiate a social event to raise money for a philanthropic endeavor, such as promoting a high school sports team. With hard aspects, however, Mars will attack the planet even while being unconsciously influenced by it. The native may feel angry in response to the overly aggressive expression by someone else of whatever the other planet symbolizes. Later, as the aspect becomes more integrated, the individual can consciously utilize that planet’s energy in the service of Mars’ own objectives. Imagine, for example, Mars Taurus in the 6th square Pluto Leo in the 9th. The individual may work (6th) as a landscape (Taurus) engineer (Mars). Frustrated by unjust ecology regulations imposed by the EPA (Pluto in the 9th), he accuses the EPA of corruption and complains that their regulations (closing square) are too extreme and that they restrict his freedom to excavate lands and transform grounds into healthier, more creative settings. As integration of the square occurs over time, however, he may become more proactive and advocate for laws that do not criminalize natural rights or obstruct the freedom of property-owners to renovate, preserve, and enhance the value of lands they legitimately own. Here, Mars is using Pluto in the 9th to greater advantage. Astrological archetypes are embodied in characters that are interrelated and thus self-consistent in meaning. For Aries-Mars, these include the warrior, competitor, pioneer, adventurer, explorer, and noble savage. Aries-Mars fights for freedom and the right to exist (warrior), competes for survival and available goods (competitor), pursues adventure and novelty for its own sake (adventurer, pioneer), and embodies a childlike naivete and simplicity of spirit (noble savage). With Sun Aries trine Mars in Leo, Thomas Jefferson was one of the founders of the United States. The Mars’ verb to found means to establish and originate an institution, organization or (in this case) a country. Consistent with Aries-Mars, Jefferson’s pioneering action of founding America also required a willingness to fight for our nascent country’s freedom. Jefferson immortalized Aries-Mars in his Declaration of Independence, which in effect was a declaration of war against England that launched the birth of a new nation. Years ago when I lived in California, I had a Sun-Aries friend named Arden who was a psychotherapist. Her name suitably hinted at a core Aries trait―ardent (fervent, enthusiastic). She certainly was that. I’ll never forget her blazing eyes and sparkling smile. Arden was so alive. On the wall of her office was a poster of a cracked egg out of which was emerging a newly hatched baby chick. Below were the words, “Go forth and conquer!” Arden’s poster epitomized not merely her personality, but Aries as a maturational phase of life. Like every zodiacal sign, Aries constitutes a developmental stage during which its needs and traits are predominant. I discuss this more fully in Aries as the Sensorimotor Stage of Development. Suffice to say that Aries constitutes the first stage of life, or birth to age two (a two-year period), during which the child’s perspective in time-space is relatively limited to the here and now. Babies have little sense of before or later, nor of any place but their current surrounds. Experience is confined to the eternal present. The emotional corollary to this time-space perspective is joy―or, rage when wants are frustrated. Infants are typically happy but quick to anger precisely because they have no sense of later. If only the now exists, then every impulse must be immediately satisfied since there is no other time but the present. To be enthusiastic about life may simply be life’s feeling for itself. The very word “enthusiasm” derives from the Ancient Greek enthousiasmós, which consists of the root words “theos” (god) and “en” (in); thus, enthusiasm literally means “God within.” For the Greeks to be enthusiastic was to be inspired by, or more precisely, possessed by the gods. That happiness is the natural state of life is an intriguing idea with profound implications. Indian sage Poonjaji asserts that the potential for happiness is always present but can only be attained by disidentifying with the ephemeral contents of consciousness; in other words, neither worrying about the past nor stressing over the future. Happiness is the underlying constant, whereas the causes of unhappiness come and go. If a person identifies with what comes and goes―attachments, possessions, things, jobs, or relationships―then unhappiness is sure to follow, for no experience and no object is permanent. The only experience that is truly permanent is the observing Subject; that is, one’s subjective experience of witnessing the contents of consciousness as they arise and pass away, moment to moment. By identifying with what is permanent―the observing Self―the seeker is happiness itself, a state of enlightenment indistinguishable from God. Given Poonjaji’s teaching that happiness is being in the now, it is fitting he has Sun conjunct Mars with both planets squaring Uranus. Another new age guru, Baba Ram Dass, has Sun conjunct Uranus in Aries. That being in the now is consistent with the psychology of Aries-Mars is underscored by the title of Ram Dass’s classic 1971 book, Be Here Now. Yet another spiritual teacher, Eckhart Tolle, wrote a best-selling guide to spiritual enlightenment titled The Power of Now (1997). Tolle has Sun Aquarius tightly opposing Mars Leo. It is certainly noteworthy that Tolle, Ram Dass, and Poonjaji all have a strong Aries-Mars connection to their Sun, which, in turn, is linked to the archetype of Aquarius-Uranus. Poonjaji has Sun conjunct Mars and square Uranus; Ram Dass, Sun conjunct Uranus in Aries; and Tolle, Sun in Aquarius opposed Mars in Leo. Each seems to exemplify and remind us that enlightenment is a state of happiness, and that happiness is being in the now. Sports best exemplifies the joy of being in the moment. While team sports are mostly a Leo phenomenon, every sport has an Aries component if only because of its raw action, competition, and immediacy of focus. If a competitor is going to win, he or she cannot be thinking of before or later, yesterday or tomorrow. The present is all that matters. And once having won, joy typically erupts. It’s interesting to note that many of the same Aries-Mars words that describe war equally apply to sports. Examples are so numerous it could make for its own article. If a team wins by a narrow margin, “they barely survived.” But if the team loses badly, “they got killed…it was a slaughter.” And if an athlete “beats” his opponent, it could mean that he won the match or that he assaulted the other player. Hopefully not the latter, though in boxing it means both! At the time of this writing, we’re in “March Madness” when top college basketball teams vie for the national championship. In Connecticut where I live, UConn Women’s Basketball is legendary. Over the past twenty years they’ve dominated the sport, winning four straight national titles and twelve overall since 1995. That’s a national title on average every other year for twenty years. During this twenty-year run, UConn had 6 undefeated seasons, whereas all other teams combined total 3. UConn’s current win streak is 111 straight games, the most ever in basketball for men or women. Why are they so dominant? Most everyone agrees it’s their coach, Gina Auriemma, a squarely built, feisty Italian-born Sun Aries pug who consistently produces teams that embody Aries-Mars characteristics to a degree other teams simply cannot match. Inspired by Gino, UConn woman play with unbridled joy and aggression―fiercely competitive, stifling pressure defense, relentless fast break offense, perpetual motion in perfect harmony. And like the Terminator, they never, ever stop, even when fifty points ahead. A consensus is building that Auriemma may be the greatest coach of all time in any sport. In addition to Sun and Venus in Aries, his Mars is in Sagittarius, the sign of coaching, and forms a grand fire trine with Pluto Leo and Venus Aries while opposing its own dispositor―Jupiter in Gemini. This configuration is reflected in his teams. One Aries-Mars trait especially marks Gino’s girls: they’re always in the moment. Auriemma pushes the point endlessly. Play every game like it’s your last. Don’t get ahead of yourselves. Treat every team, every moment the same: Go for it. There’s only the now. Past victories don’t matter. You’re only as good as your last win. Auriemma is the ultimate happy warrior renowned for his impish smile and sharp sense of humor. He doesn’t worry that he’s running up the score or whether other coaches resent UConn’s dominance. Gino has one direction―forward; one speed―fast; and one objective―win. Everything else fades into the background, trivia of little or no consequence. Compared to UConn’s perfectly orchestrated ballet of war, other teams look like they’re in slow motion. They seem lazy, sloppy, lacking those essential Aries traits that Gino’s girls have in abundance: fire and competitive zeal. While no streak lasts forever, it is remarkable that one man’s Aries-Mars energy can spread itself over dozens of teams and impact countless lives. UConn women’s basketball is Gino; his personality is indelibly stamped on every team he coaches. The Nike ad line “Just do it” epitomizes the Aries-Mars attitude, the hallmark of which is courage. Eleanor Roosevelt famously said, “Courage is fear that does not control you.” Likewise, GK Chesterton asserted that courage is a paradox because it means a desire to live with a readiness to die. While attributed to Goethe, this quote actually has its origins in the Old Testament. The Lord continually exhorts his prophet, Joshua, to “be strong and courageous” in leading the Israelites to the promised land. God promises that if Joshua is sufficiently bold, then He will lend a hand; God will meet Joshua half-way. In Greek and Roman mythology, Fortuna (or Tyche) was the goddess of fortune and personification of luck, both good and bad. It is of no small significance that Fortuna’s favor was closely tied to virtus, a virtue that connotes valor, boldness, manliness, courage, and strength of character―all obvious Aries traits. As a goddess, Fortuna made clear that women are not exempt from the requirement of virtus. The Greeks believed that citizens who lacked virtus, male or female, invited ill-fortune on themselves. I have often reflected on whether Aries-Mars should be considered a divine value. By “divine value” I mean a human capacity favored by God (or the gods) on a par with more obviously spiritual sign-planet archetypes such as Sagittarius-Jupiter and Pisces-Neptune. From an astrological perspective, the entire cosmos is the visible body of God; or, as Manly Hall put it, “astrology is a religion inasmuch as it reveals the anatomy and psychology of God.”7 Hall would argue that God is the summary product and source of all astrological variables, including Aries-Mars. In ancient astrology, an aspect between two planets meant that each planet sees only that “face” (side, aspect) of the other, not the planet as a whole. Likewise, every angle that comprises the zodiac is but one face of the zodiac―that is, a face of God. These various faces of the One were commonly regarded as gods themselves, ancillary deities, each playing a subordinate role in the service of a divine whole. As the 0° angle, Aries is singularly important, for it is the first face of God, the beginning of our knowledge of the Absolute. Like a divine spark, it sets in motion the process of evolution that the zodiac symbolizes. If life grows, develops, and leads to the gradual return of all self-actualized beings to source consciousness (enlightenment), then life itself―Aries―is primary, for without it nothing else can happen. Every other sign, or angle, derives its meaning from its relation to Aries. No! You stay alive! If they don’t kill you, they’ll take you north up to the Huron lands. Submit, do you hear? You’re strong! You survive! You stay alive, no matter what occurs! I will find you! No matter how long it takes, no matter how far. I will find you! A final embrace, and Hawkeye hurls himself through the waterfall and plummets to the icy waters below. Within days, he tracks down Cora as the film races to its climax. What makes the scene so powerful is the sheer emotional intensity of Hawkeye admonishing Cora to stay alive. It is simultaneously a moment of transcendent love and infectious courage. Stay alive! For otherwise there is no future, no progeny, no evolution back to source. This is the divine imperative, the first law of nature, and why we intuitively know suicide is wrong, that any pointless death is wrong. Survive. Stay alive. Fortune favors the brave. If survival is the first if not prime directive, then perhaps God does require the full development and actualization of Aries-Mars capacities as a condition of favor. Aries is the elan vital, the spark of life. It bestows a willingness to assert for what we want, to act in our own self-interest, to draw a red line in the sand and hold it, compete for dominance, fight for survival, kill if necessary (just war), and place personal preferences on a par with those we love. In short, the Divine includes within Itself the principle not merely of births and beginnings, but of aggression, war and violence, too. This should not imply that Aries-Mars is favored solely for itself, but that it is an essential component of a balanced, integrated psyche. A fully individuated, self-actualized person utilizes Aries-Mars in the service of every other psychological capacity symbolized by the zodiac: to secure prosperity, to speak candidly, to protect the young, defend one’s honor, work arduously, assure fairness, expose and eliminate corruption, fight for justice, risk failure in the pursuit of success, initiate change for the greater good, and, finally, to have the courage to surrender to God’s will and accept what cannot be changed. Without Aries-Mars to galvanize into action and strengthen our overall psychic economy, other capacities are proportionately weakened, impotent, or stillborn. I was recently watching a Kevin Costner flick, 3 Days to Kill, when I thought to myself, “Why am I enjoying this?” It’s about a CIA agent estranged from his wife and daughter because he’s constantly being sent out to kill bad guys. It occurred to me that such films are just updated versions of the Paleolithic hunter who kills to feed his family. For untold thousands of years, that’s what men did: bash, spear, and shoot other animals, then bring them home to the wife and kids to eat. Everybody’s happy. Now we can’t do that anymore. Our animals are bashed, speared, and shot by corporations called Safeway and Food Lion. We’re deprived of the hunt, so we watch hunters in movies with names like Rambo, James Bond, and Ash Carter. Zombie TV shows like The Walking Dead allow us to collectively channel our desire to kill. And since zombies are technically already dead, we don’t have to feel guilty about it. We can just kill them, endlessly. Aries-Mars is the part of us that will do whatever it takes to assure the continuance of life; well, at least our life, and those we love. Paradoxically this means we must be willing to take life―whether of animal, fish, bird, plant or zombie―to sustain life. That’s Mars’ prime directive, and it does not suffer any guilt about it. Again, this contrasts markedly with traditional spiritual archetypes like Pisces-Neptune wherein empathy, compassion, and self-sacrifice are the norm. When Pisces’ perceives suffering, it evokes existential guilt and the impulse to rescue. “I am my brother’s keeper,” say Pisces. “We’re all in this together.” This is not the part of us that will slash a deer’s throat then cook it over an open fire and eat it on the spot. If there’s one thing astrology makes clear, it’s that favoring one archetype over the other is folly. For all are interdependent and required for a balanced whole, even if the zodiac also shows that later signs transcend but include those that come before. The point is, steps cannot be skipped. As the last sign, Pisces-Neptune is infinitely forgiving; yet, as the first sign, Aries-Mars abhors cowardice and the pretense of helplessness. Man up. Pull your own weight. Compete. That this attitude is consistent with, and indispensable to, a grounded spiritual sensibility is reflected in a poem by John Ciardi titled “In Place of a Curse”. This same attitude is epitomized in Gino Auriemma’s approach to coaching. There’s a video of Auriemma on YouTube with 39 million views. He’s answering a question that references the enthusiasm on the UConn bench after the Huskies make a basket. Mind you, these are the girls who are not playing. Note how this contrasts with Piscean forgiveness, compassion for victims, and the impulse to relieve suffering. Aries-Mars says, “Shake it off, stay strong, get back in the game!” Auriemma is so insistent that his players maintain a positive competitive attitude that to display otherwise virtually assures you will not play, ever. I have to wonder, maybe in part that’s God’s mind-set, too. Mohatmas Gandhi, India’s spiritual leader and perhaps the greatest exponent of non-violence the world has ever known, counseled that “where there is only a choice between cowardice and violence, I would advise violence.”9 He went on to explain that he would rather have India resort to arms to defend her honor than cowardly submit and remain a helpless witness to her own dishonor. My treatise would be incomplete without mention of Aries-Mars’ dark side. First, it should be known that every sign-planet system correlates to a specific personality disorder that reflects an excess of that archetype. For Aries-Mars, this can show up as too much Aries-Mars in a chart or, more typically, an overcompensation of Aries-Mars due to intrapsychic conflict. Frequently it is both, examples of which I will provide momentarily. The point is that under the right horoscopic circumstances any sign-planet archetype can be expressed in an extreme, unbalanced way, which is precisely what defines psychopathology. Since I have written elsewhere on this topic, let me cut to the chase.10 A personality disorder is characterized by four factors: rigidity, excess, impairment, and distress. First, the person tends to be rigidly preoccupied with a singular need as symbolized astrologically by the relevant archetype. In the vernacular, we call this “being stuck”. If someone is inordinately afraid they will not get that sign-need met, they are apt to over-rely upon a specific mode of behavior (planet) designed to fulfill the need. Second, they do that behavior to excess; that is, they not only do it constantly (rigidity), they do it at an extreme amplitude (excess). If the behavior were a song, they would continuously play that song at a volume that is deafening. Third, a personality disorder correlates to diminished capacity to fulfill the need in question (impairment), which, again, is generally due to the person’s overfunctioning in a way peculiar to the disorder (rigidity and excess). By trying too hard, their behavior backfires; in a word, it is dysfunctional. Fourth, while individuals with a personality disorder often do not recognize their part in creating problems, distress is nevertheless a natural consequence of the problematic behavior. The person will simply blame something or someone else for their suffering. If someone displays 3 or more of the above traits to a degree that meets the criteria of a personality disorder―rigidity, excess, impairment, and distress―they are probably a psychopath. Virtually every trait of psychopathy is consistent with an extreme, unbalanced expression of Aries-Mars. There is generally a history of hostile, aggressive behavior in which the rights of others are violated. The need for independence is so extreme that there is an impaired capacity to sustain lasting, warm, and responsible relationships with friends, lovers, or employers. Cheating and promiscuous behavior are common. An infantile need for immediate gratification impairs their capacity to accept social norms with respect to lawful behavior. Antisocial actions include, but are not limited to, illegal occupation, destruction of property, theft, assault, and spousal and child abuse. Thoughtless, reckless behavior leads to accident proneness as typified, for example, by recurrent speeding and/or driving under the influence. Lack of reliability is evident in a troubled and unstable work history with frequent absences and quitting of jobs without a plan. Irresponsibility is especially apparent in a failure to honor financial obligations, such as paying bills, taxes, rent, loans, or child support. If my thesis is correct that psychopaths are inordinately preoccupied with Aries’ needs for survival, freedom, action and novelty, then impairment would lie in not being able to fulfill these needs. Due to their excessive recklessness and the anger they provoke in others, the very nature of psychopathic behavior endangers the psychopath’s existence. And even if they do survive, they are often incarcerated because of their criminality, thus losing their freedom. This, in turn, impairs their ability to act as they wish or pursue new experiences. In short, everything to which the psychopath is excessively devoted is ultimately compromised or lost altogether. Recall that antisocial personality can by symbolized by too much Aries-Mars in a chart. This can take the form of multiple planets in Aries, a packed 1st house, or a stellium regardless of planets and signs involved. In addition, if Mars is under stress via hard aspect, this can lead to Martian overcompensation as a defense against the planetary impulses with which it conflicts. When any of these factors combine, there is significant potential for Aries-Mars pathology―though it is never guaranteed. Any configuration, no matter how difficult, can always function in healthy ways at higher levels of integration. Meanwhile, examples of psychopathy are legion and occupy every stratum of society. Former CEO of Enron, the infamous Ken Lay, is the poster child for predatory, sociopathic corporations that exploit the public trust. 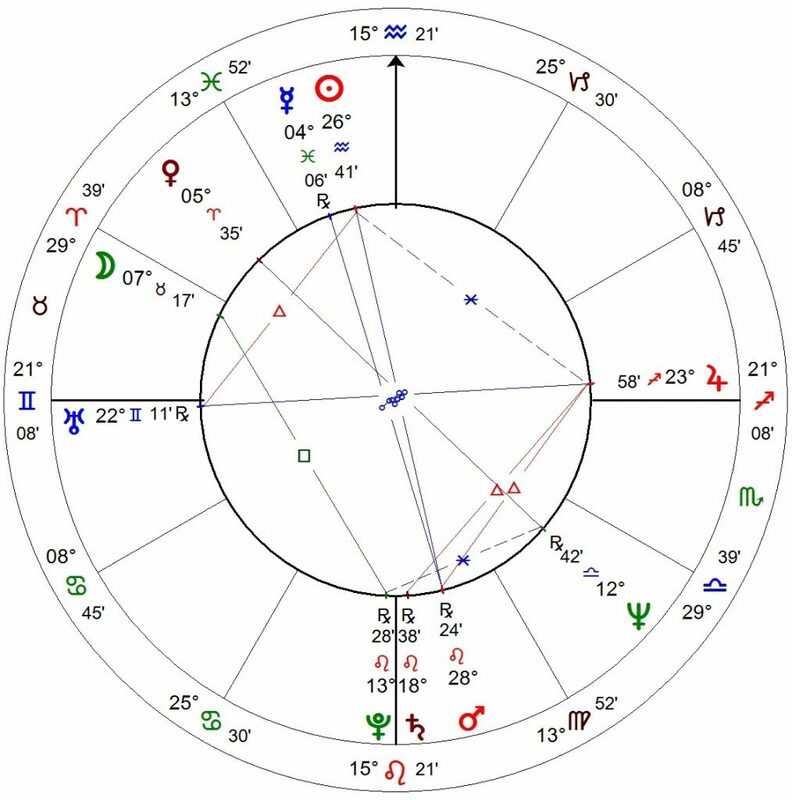 Lay has Mercury, Sun and Moon conjunct in Aries, with all three planets sextile a Mars-Jupiter conjunction, which, in turn, is stressed by a square to Neptune. He was convicted of 10 counts of conspiracy and securities fraud, causing 20,000 Enron employees to lose their jobs and life savings. Found guilty by a grand jury in May of 2006, two months later he died of a heart attack at age 64. Another notorious psychopath, Richard Allan Davis, has a stellium of five planets in Cancer in the 8th house, all of which oppose Mars Capricorn in the 2nd. In addition, Mars forms a quincunx to his Sun, which is the Sun’s only aspect. Davis was a career criminal who served time for breaking and entering, burglary, auto theft, forgery, assault and kidnapping, all prior to being charged with the infamous 1993 kidnap-murder of 12-year old Polly Klaas in Petaluma, California. He kidnapped Polly during a slumber party at her home, then drove to a cow field where he sexually assaulted and strangled her. Davis is currently on death row in San Quentin. Our third and final example is Richard Kuklinski, a serial murderer and contract killer responsible for the deaths of up to 250 men between 1948 and 1986. Kuklinski has Mercury and Sun in Aries, with the Sun forming an opposition to Mars, as well as a square to Pluto. Sun Aries opposing its own dispositor, Mars, is a particularly lethal combination in that there’s a preponderance of Aries-Mars energy that also entails significant intrapsychic conflict, thus causing both Sun and Mars to overcompensate in resistance to the other. This is like stretching a rubber band to the breaking point. In this last sentence, “the greater the odds against me, the more juice I got out of it,” we hear evidence of Sun Aries opposing its own dispositor, Mars. It’s as if Kuklinski had to create a situation in which his own existence was threatened by his solar intention to annihilate the existence of the other (Mars). We also hear a chilling echo of the Paleolithic hunter who stalks and kills his prey. Kuklinski had a wife and two kids and all they knew was that he put food on the table; he was a good provider. The Iceman was captured and sentenced to life imprisonment at age 50. Afflicted with a rare and incurable inflammation of the blood vessels, he died 20 years later chained to a prison hospital bed. Inflammation, fittingly, is an Aries-Mars malady. Aries-Mars derives its meaning from the angle it signifies in a 360° astronomical cycle. That angle is 0°, which marks the start of the zodiac, 1st house, and conjunction. As such, Aries-Mars correlates to the principle of beginnings. Psychologically, Aries is experienced as a set of self-consistent needs for survival, freedom, action, and novelty. As the active agent of these needs, Mars’ primary functions are to assert, initiate, fight, and encourage. This is especially apparent in aspects with other planets wherein Mars emboldens and galvanizes those planets to fervent action. As a developmental stage, Aries-Mars signifies the first two years of life. Just as the world of infants is constricted to me here now, so the psychology of Aries-Mars reflects this same orientation. Its natural egocentricity, assertiveness, and impatience is inextricably wedded to the perception that only the present exists. A further corollary to being in the now are the emotions of joy and enthusiasm, which seem to express life’s natural state. Sports and competition provide a vehicle for Aries-Mars energy. Courage not only epitomizes Aries-Mars, it may be that valor is accompanied by luck precisely because higher powers require boldness for the full development and furtherance of life’s evolution back to source. Yet, if expressed solely for its own sake―that is, in an extreme, unbalanced manner, Aries-Mars can vampirize the psyche. As such, it correlates to psychopathy, often with lethal consequences. It is easy to be conflicted about Aries-Mars. The potential for over or under doing it are strong, and can lead to painful, ugly outcomes, not the least of which is war in one form or another. And yet, there are ways of doing even war correctly―that is, valiantly. And so we celebrate in myth and folklore those who express Aries-Mars in proper balance with all the other ways of being human. For without a sufficient embodiment of its core virtues―strength, courage, independence, self-assertion, and a capacity for anger when natural rights are threatened―we forfeit our lives and those we love in a dim cowardice, abandon the field to the worst among us, and, still worse, betray the gods. 1 A synodic cycle is the period time it takes between the conjunction of two planets and their next conjunction. During a synodic cycle, the faster of the two planets will form a series of 30° angles (aspects) with the slower planet, eventually catching up to the slower planet and forming a new conjunction. 3 Scobie, Claire (2003-08-01). Why now is bliss. Telegraph Magazine. Retrieved on 2017-03-31. 4 McKinley, Jesse (2008-03-23). “The Wisdom of the Ages, for Now Anyway.” New York Times. Retrieved 2017-03-31. 6 Magill, Frank N. The Ancient World: Dictionary of World Biography, Volume 1. Routlege, p. 226. 10 Perry, Glenn (2012). Depth Analysis of the Natal Chart. East Hampton, CT: APA Press. See especially Chapters 6, 8, and 10. Fabulous post, Glenn! So deeply informative, with so many helpful perspectives of Aries-Mars dynamics.